The Milky Way’s stellar halo – a roughly spherical distribution of stars surrounding our spiral galaxy – is a valuable tool for probing the early evolution of our galaxy. The stellar halo contains some of the oldest stars in our galaxy, whose properties reflect that of the environment in which they formed. This paper focuses on using cosmological simulations of galaxy formation to match the observed structure and kinematics of stars (how they move) in Milky Way’s halo. There are several outstanding discrepancies between the stellar halos that have been simulated in the past and the observations of actual specimens. First, simulations did not reproduce the distribution of metal poor and metal rich stars in the halo. Second, halos in simulations are more spherical than the slightly flattened halos seen in real galaxies. Third, the metal content of stars in the halo and their kinematics point towards two distinct groups of stars, which is not reproduced in simulations. Fourth and finally, simulated halos display more substructure than real halos. The first paper in this series showed that simulations from the GIMIC code (Galaxies-Intergalactic Medium Interaction Calculation) can correctly model the metal distribution of halo stars, thereby addressing the first issue. In this paper, the authors explore whether they can address the second and third issues. Part of the problem is thought to be in the formation mechanism assumed in most cosmological simulations. One road to the formation of stellar halos, and the one implicitly assumed in most simulations, is that stars were deposited in the halo when small galaxies were disrupted when they passed near the Milky Way. However, a suite of papers has demonstrated that another path is also important: the direct formation of stars in the halo. By including this second path, the in situ formation of halo stars, the authors hope they will be able to reproduce the stellar halo’s flattened shape and two-component nature. It makes sense that this might do the trick: stars formed in situ will rotate along with the Milky Way, thus giving the halo a more oblate shape, and will naturally provide a second stellar component. The hydrodynamical GIMIC simulations draw on the work of the Millennium Simuation, a large scale simulation of galaxy formation within a cosmological context. 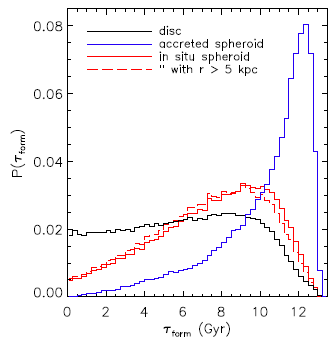 Differences in age between the in situ and accreted components of the stellar halo. Figure 3 from the paper. The authors select 5 regions with masses similar to that of the Milky Way and re-simulate their evolution. The re-simulation is done at a higher resolution and includes star formation and feedback from supernovae. A star is said to be formed in situ if it formed within the dominant dark halo and is said to be accreted if it formed in a satellite galaxy or otherwise outside the dominant halo and was later accreted onto the main galaxy. The authors find that the in situ component was formed from heating of the precursor to the galactic disk and that the accretion of satellite galaxies is likely responsible for that heating. This fits with the fact that the accreted stars in their simulation are on average older than the in situ stars and that both populations are older than the stars in the galactic disk. The results from this simulation with respect to the structure of the stellar halo and its two-component nature are in agreement with observations. The halo is observed to be flattened to a degree consistent with that observed in the Milky Way and other nearby galaxies. This results from the fact that the in situ component formed from the proto-Galactic disc and late enough that the proto-disc was in fact already formed. Additionally, the in situ and accreted components are distinguished in age, metallicity and rotational velocity. A further test of this model is whether the simulations can also account for the fourth issue mentioned above, that of over-producing stellar halo substructure. Featured image: model of the stellar halo of a galaxy like the Milky Way (Credit: K. Johnston, J. Bullock). The complex nature of the stellar halo results from the disruption of passing satellite galaxies. See also a movie here.